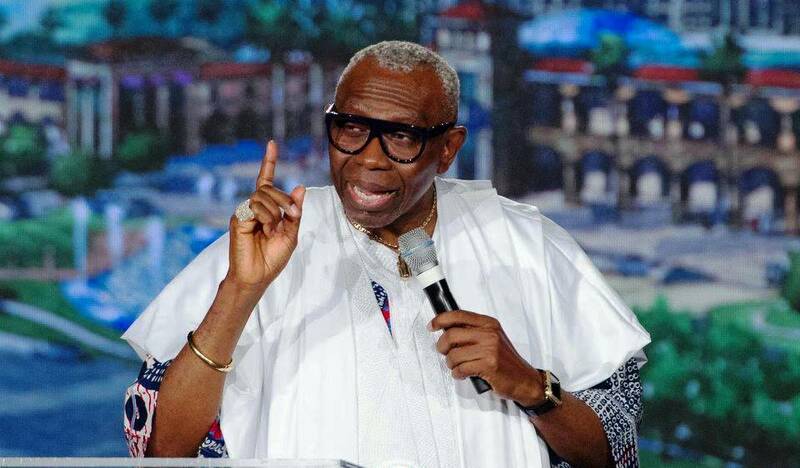 Born Ayodele Joseph Oritsegbubemi Oritsejafo popularly customized as Papa Ayo Oritsejafor, is the founding father and Senior Pastor of Word of Life Bible Church, located in Warri, Delta State Nigeria. He held the position of The National President of the Pentecostal Fellowship of Nigeria (PFN) from February 7, 2005 to 2010. He was also appointed as the President of the Christian Association of Nigeria(CAN) in July 2010 which is the apex body of all Christians in the country Nigeria. Pastor Ayo Oritsejafor Ministries (Word of Life Bible Church) is the very first Nigerian church to launch a Miracle crusade (Lagos Miracle Crusade) from Africa to world audience, thru satellite, in year 1987 with evangelist Joe Martins. He is a famous pastor who is widely recognized for his honesty and fearlessness. Pastor Ayo Oritsejafor was birthed on November 10, into the family of Mr. Joseph Monday Oritsejafor and Mrs. Roli Durojaiye Oritsejafor in Lagos, Nigeria. His mother was a devoted christian who couldn’t have a male child, she prayed for many years with the hope that God will one day bless her with her desire. She vowed that if God give her a male child that she will would bring him up in his ways without allowing the things of the world to come near him. It become a dream come true for her when she gave birth to him and she named him Ayodele: joy has come to our home. God's Genereal - Ayo Oritsejafor Biography – Age, Wife, Children and Message! After his birth, he couldn’t say a word until he was five years old and the strange part was that the Doctors said nothing was wrong with him; yet he couldn’t speak. He got his voice on his fifth birthday and everyone was amazed when eventuallystarted talking; not like a child learning how to talk but fluently and maturely like any normal child. His mother who is a devoted member of the Christ Apostolic Church (CAC), the used to lay baby Ayo on the church altar for hours praying that God would heal, touch, bless and use him . Ayo’s father died when he was still very young and the incident opened a fresh path for his life. Pastor Ayo is married to Helen Oritsejafor. They got married in 1997 at the Redeemed Christian Church of God (RCCG), Lagos, Nigeria. The family is blessed with beautiful triplets: sons Ayodele Joseph, Ayodeji and daughter Ayodeta Helen. They reside in in Warri, Nigeria. Today, the man of God is a pastor; he is a teacher, evangelist, prophet, author, philosopher, and philanthropist. He is a father , friend and mentor to millions of people around the world and highly praised for his good work . He was the person that brought the crisis in Niger Delta area of Nigeria to an end. He was heavily criticized after he was elected as the new president of the National President of CAN, and he became the headliner of national television stations, radios, and newspapers all because of his out-outspokenness in consistent defense of the Church in Nigeria. He founded African Broadcasting Network, an international satellite Christian television station intended to promote the gospel of Christ from Africa to the world. This is a satellite channel broadcasting from London and it has a coverage that covered the whole of Africa and some part of Asia and Europe. The servant of God has received couple of awards both internationally and locally in regards of his various peace and humanitarian initiatives. He was honored with the International Youth Ambassador for Peace Award. He has been honored with the Golden key to the City of Kalamazoo, Michigan by the mayor of the city. Oritsejafor was conferred an Officer of the Order of the Federal Republic (OFR) one of the Nigerian National Honours at the International Conference Centre, Abuja on December 22, 2008. Oritsejafor is also known for his philanthropic work, he see this as a way of giving back to the society irrespective of their religion and race. He offers scholarships to indigent students in various tertiary, secondary and elementary institutions not minding their tribe or denomination. Oritsejafor and his wife Helen partnered with Flight Micro Finance Bank to start an empowerment programme for the people in year 2005. He has contributed a lot to help and empower the less fortunate people in the society. According to revelations, we learnt that he hasn’t been able to pay for his private jet maintenance and as a result, it has been seized. Breaking the Power of Yesterday. The Stone That Killed Goliath. Faith Antidote for Daily Living. A Voice in the Wilderness. How to get answers to unanswered prayers.